Vienna’s famed ‘Ring Road’ (Ringstraße) is a ~5km loop built along the former medieval city fortifications. It’ a great opportunity to see many important Vienna landmarks, while getting a workout in! There’s good variety, including some of the city’s finest buildings, several important parks, and a jaunt along the Danube paths. This is a ‘busy’ run — the main road is traffic-y and there are lots of people on a busy day. But there are dedicated walking paths much of the way, and an opportunity to run through some of the parks aligning the road. Best to go early! A good starting point is the Schottenring subway stop, near the water. Head away from the water, along Schottenring. After 1km, reach the University of Vienna and Sigmund Freud Park, and the Rathausplatz park (ice rink in winter, cinema in summer). 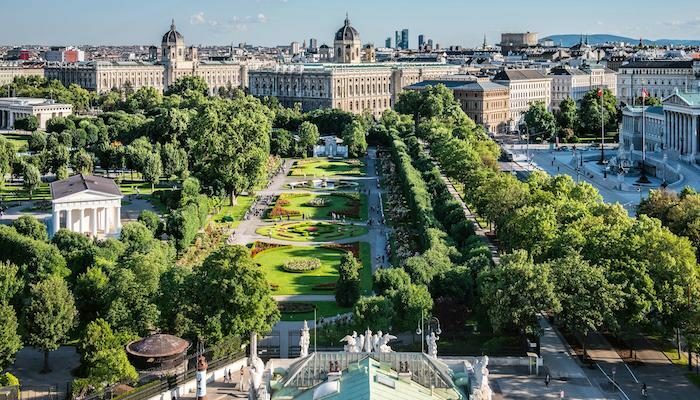 At 1.7 km, reach Volksgarten Park, opposite Parliament, and then Heldenplatz , in front of the old imperial Hofburg Palace, and then the more formal Burggarten with its conservatory (you can run through the parks here instead of the square). A kilometer later, turning back toward the water, reach the Stadpark, an English-style, 19th-century public park with a river, ornate bridges & gilded Johann Strauss statue. Several hotels line the park. Run through the park’s paths for just under 1km, and then see the impressive Regierungsgebäude government office before reaching the water. Then, run along the waterside paths or the path along the main road, back to the start. There are lots of add-on and variety options here — run through the parks instead of along the road, continue along the water for more mileage, or hop across one of the bridges to the Prater Park.